A native of South Florida, Idanis Gallimore is a seasoned musician and violinist. She has had the pleasure of playing music in a myriad of genres. Her experiences include premiering works for new composers at New World School of the Arts (NWSA), opera accompaniment and plenty of orchestra experience. She has played with the NWSA Symphony Orchestra, the Miami-Dade College Chamber Ensemble, Alhambra Orchestra, the Riuniti Opera Orchestra and others. In January of 2013, she had the pleasure of playing in Sandy Patti's show. Outside of classical music, she has had the opportunity of playing in Jazz combos, Cuban charanga music, gospel music and musicals. 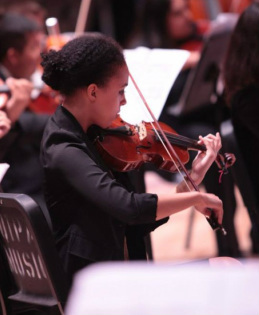 Currently, she is studying at the University of Texas-Pan American under the tutelage of Daniel Andai and enjoys performing in the Valley Symphony Orchestra in McAllen,TX.